To create a group, right click on an existing group or on the main Groups directory in the left of the dialog. You can also select a group and click the Add Group button. The new group will be a sub-group of the selected one. Create Smart Group is similar to creating group, but instead select Smart Groups. The dialog box allows user to choose the expression to select symbols in order to appear in the smart group (contains some tags, member of a group, have a string in its name, etc.). Any symbol that satisfies the entered condition(s) is automatically added to the smart group. To remove a group or a smart group, right click on the group and select Remove Group or select it and push Remove Group button. Unlike the smart groups that automatically fetch their belonged symbols, simple groups are filled by the user. To add a symbol into a group, you can either right click on a symbol, choose Apply Group and then the group name. There is a second way to add several symbols into a group: just select the group, click and choose Group Symbols. All symbols display a checkbox that allows you to add the symbol into the selected groups. When selection is finished, you can click the same button, and choose Finish Grouping. All the symbols that are not placed under a custom group belong to a default group named Ungrouped. To delete a symbol you no longer need, just select it and click Remove item (also available through right-click). The symbol will be deleted from the local symbols database. 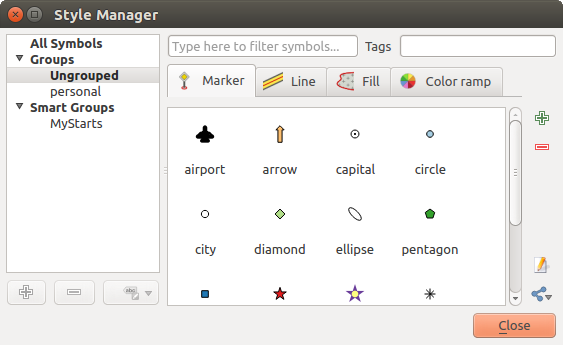 The symbol list can be modified by adding new symbols with Add item button or modifying existing ones with Edit item. See The Symbol Selector for further information. The Share item tool, at the right bottom of the Style Library dialog, offers options to easily share symbols with others: users can indeed export their symbols and import symbols to their library. You can export the selected symbols to PNG, SVG or XML file formats. Exporting to PNG or SVG (both not available for color ramp symbols) creates a file for each selected symbol, and the SVG folder can be added to SVG Paths in Settings ‣ Options to e.g. share these symbols on a network. The XML format generates a single file containing all the selected symbols. This file can then be imported in another user’s style library. Note that import and export options are also available through right-click. The Color ramp tab in the Style Manager presents different types of color ramps you can use to style layers. Graduée: génère une palette de couleurs à partir d’une couleur de départ et une couleur de fin, soit de type continue or discrète. En double-cliquant sur la pré-visualisation de la palette, vous pouvez ajouter autant de couleurs intermédiaires que vous le souhaitez. 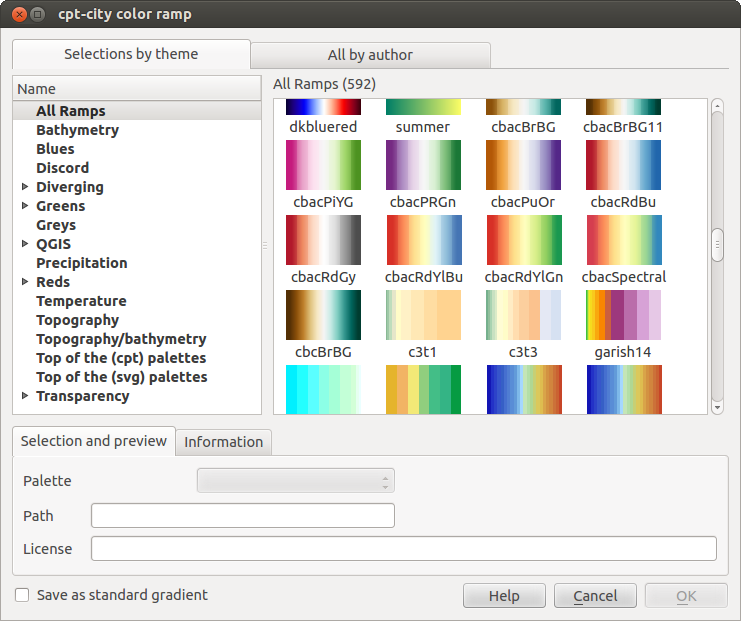 or cpt-city: an access to a whole catalog of color gradients to locally save as gradient color. Double-clicking the ramp preview or drag-and-drop a color from the color spot onto the ramp preview adds a new color stop. 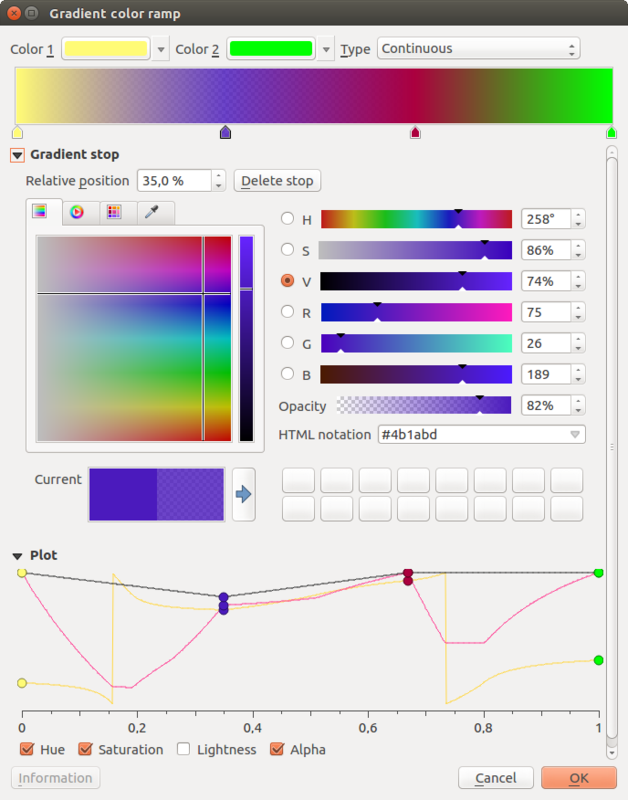 Each color stop can be tweaked using the sélecteur de couleur widgets or by plotting each of its parameters. You can also reposition it using the mouse, the arrow keys (combine with Shift key for a larger move) or the Relative position spinbox. Pressing Delete stop as well as DEL key removes the selected color stop. You can use the Invert option while classifying the data with a color ramp. See figure_color_custom_ramp for an example of a custom color ramp and figure_color_cpt_city for the cpt-city Colors dialog. The cpt-city option opens a new dialog with hundreds of themes included ‘out of the box’. Le sélecteur de symbole est la boîte de dialogue principale pour construire un symbole. Vous pouvez créer ou éditer des marqueurs, des lignes ou des symboles de remplissage. and settings to configure the selected symbol layer in the tree. A symbol can consist of several Symbol layers. The symbol tree shows the overlay of these symbol layers that are combined afterwards to shape a new global symbol. Besides, a dynamic symbol representation is updated as soon as symbol properties change. Ajouter une nouvelle couche de symbole: vous pouvez empiler autant de symboles que vous voulez. Supprimer la couche de symbole sélectionnée. Verrouiller les couleurs d’une couche de symbole: une couleur verrouillée reste non modifiée lorsque l’utilisateur modifie la couleur du symbole global (ou supérieur). Dupliquer une (un groupe de) couche(s) de symbole. Déplacer en haut ou en bas la couche de symbole. 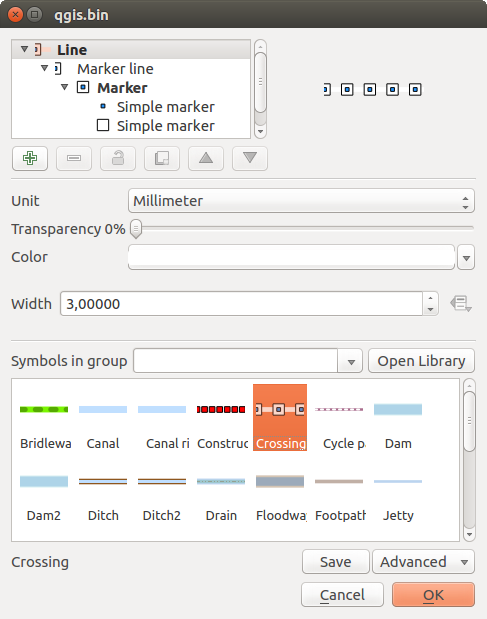 In QGIS, configuring a symbol is done in two steps: the symbol and then the symbol layer. At the top level of the tree, it depends on the layer geometry and can be of Marker, Line or Fill type. Each symbol can embed one or more symbols (including, of any other type) or symbol layers. The Data-defined override button beside the last layer-related parameters is inactive when setting the symbol from the Style manager dialog. When the symbol is connected to a map layer, this button offers access to the size assistant dialog which helps to create proportional or multivariate analysis rendering. The symbols used at this level are items you can pick from the symbols library. A list of available symbols of the same type from your symbol library is shown and can be filtered by selecting a group in the drop-down list just above. Click the Save button to add the designed symbol to your symbol library. and for line and fill symbols, clip features to canvas extent. Note that once you have set the size in the lower levels of the Symbol layers dialog, the size of the whole symbol can be changed with the Size (for marker symbols) or the Width (for line symbols) menu in the first level again. The size of the lower levels changes accordingly, while the size ratio is maintained. At a lower level of the tree, you can customize the symbol layers. 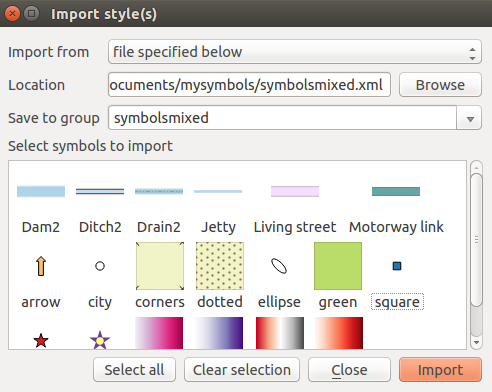 The available symbol layer types depend on the upper symbol type. You can apply on the symbol layer paint effects to enhance its rendering. Because describing all the options of all the symbol layer types would not be possible, only particular and significative ones are mentioned below. While the description below assumes that the symbol layer type is bound to the feature geometry, keep in mind that you can embed symbol layers in each others. In that case, the lower level symbol layer parameter (placement, offset...) might be bound to the upper-level symbol, and not to the feature geometry itself. SVG marker: provides you with images from your SVG paths (set in Settings ‣ Options ‣ System menu) to render as marker symbol. Each SVG file colors and outline can be adapted. In most of the marker symbols dialog, you also have a frame with previews of predefined symbols you can choose from. Use custom dash pattern: overrides the Pen style setting with a custom dash. Marker line: displays a marker symbol along the line. It can be at a regular distance or based on its geometry: first, last or each vertex, on central point or on every curve point. You can set an offset along the line for the marker symbol, or offset the line itself. The Rotate marker option allows you to set whether the marker symbol should follow the line orientation or not. Centroid fill: places a marker symbol at the centroid of the visible feature. The position of the marker may however not be the real centroid of the feature because calculation takes into account the polygon(s) clipped to area visible in map canvas for rendering and ignores holes. Use The Geometry Generator if you want the exact centroid. Outline: simple line: uses a simple line symbol layer to represent the polygon boundary. The Draw line only inside polygon option helps polygon borders inside the polygon and can be useful to clearly represent adjacent polygon boundaries. When geometry type is polygon, you can choose to disable the automatic clipping of lines/polygons to the canvas extent. In some cases this clipping results in unfavourable symbology (e.g. centroid fills where the centroid must always be the actual feature’s centroid). Available with all types of symbols, the geometry generator symbol layer allows to use expression syntax to generate a geometry on the fly during the rendering process. The resulting geometry does not have to match with the original geometry type and you can add several differently modified symbol layers on top of each other. The vector field marker is used to display vector field data such as earth deformation, tidal flows, and the like. It displays the vectors as lines (preferably arrows) that are scaled and oriented according to selected attributes of data points. It can only be used to render point data; line and polygon layers are not drawn by this symbology. or polar coordinates: in this case, attributes define Length and Angle. The angle may be measured either clockwise from north, or Counterclockwise from east, and may be either in degrees or radians. or as height only data, which displays a vertical arrow scaled using an attribute of the data. This is appropriate for displaying the vertical component of deformation, for example. The magnitude of field can be scaled up or down to an appropriate size for viewing the field.